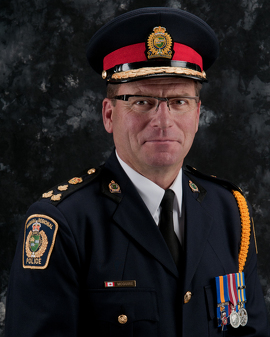 June 17, 2015 2:55 P.M.
‎"On behalf of the Ontario government, I wish to extend congratulations to Chief Jeffrey McGuire of Niagara Regional Police Service on his appointment as the 64th President of the Ontario Association of Chiefs of Police. In 2012, Chief McGuire was sworn in as the eighth chief of the Niagara Regional Police Service. Prior to assuming this role, Chief McGuire served as a member of the Toronto Police Service for 35 years, since joining as a cadet in 1977. Having served in many areas of the Service throughout his career, Chief McGuire reached the rank of Acting Deputy Chief of the Toronto Police Service and was responsible for the command of nineteen specialty units staffed by 2,300 employees. In 2011, he was inducted as a member of the Order of Merit of the Police Forces in recognition of his exceptional service and contributions to policing and community development. I know that Chief McGuire has the experience, dedication and commitment necessary for this new role, and I look forward to working with him and continuing our strong partnership with the Ontario Association of Chiefs of Police.